Upgrading the financial and accounting systems to SAP can be one of the most taxing processes during the SAP implementation. Making changes to the accounting and financial systems can cause havoc in all areas of the business and in dealing with outside businesses and resources. The SAP FI book is filled with practical examples of how to structure your accounting department and processes to utilize the FI and CO modules to save time and money. In addition, this book also includes tips for accounting and business planning managers for coordinating financial data with the corporate headquarters and other locations. – SAP is the #1 enterprise-wide computing system used in businesses today. 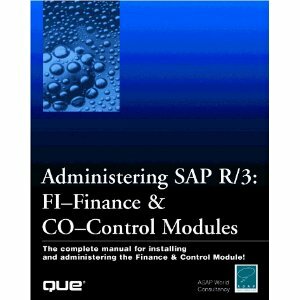 FI-Finance and CO-Control accounting modules are two of the six most popular SAP modules. – A fast, concise guide to everything the administrator needs to know to run the accounting modules of SAP. – Contains valuable tips and examples that shows financial planning and fiscal control managers how to get up and running quickly with SAP, while saving time and money. If you want to download this book, please click the picture of the book. You will be redirected to Amazon website where you will offered with an option to download Kindle version of this SAP FI book or purchase a paper version of it.